Sony will make its long-awaited entry into the tablet PC market later this year with two models based on the latest version of Google’s Android operating system. The company didn’t announce pricing details or specific launch dates, but it did offer some basic specifications and demonstrate prototypes of the two machines at a Tokyo news conference. The S1 is a slate design and has a 9.4-inch screen with 1,280 by 800 pixels resolution. At first glance it looks similar to most competing tablets, but look more closely at its profile and you’ll see it’s shaped like a wedge. 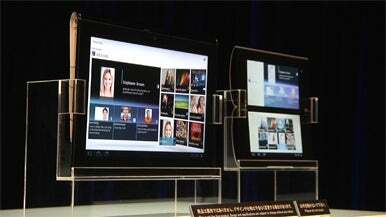 The upper portion of the tablet is thicker than the lower portion and that makes it easier to hold, said Sony. The S2 is a folding device equipped with dual 5.5-inch screens, each with 1,024 by 480 pixels resolution. It has a rounded design and is small enough to fit in the inside pocket of a jacket. Unveiling the tablet at the Tokyo news conference, Kunimasa Suzuki, deputy president of Sony’s consumer products group, reached inside his jacket and pulled it out. Both tablets will run Android 3.0, the so-called “Honeycomb” version of the operating system, and can connect to Wi-Fi hotspots and cellular networks. Sony is building support for its Qriocity online audio and video services into both tablets, and users will also be able to browse and buy electronic books. They are both based on NVidia’s Tegra 2 processor and each has front and rear cameras. On the S2, the dual screens can be used for gaming. The top screen will show the game and the bottom display will have on-screen controls that can be manipulated with the touchscreen. The tablet will be PlayStation Certified — a new program from Sony Computer Entertainment that extends the PlayStation gaming platform to other devices. Sony appears to have a lot of hope that developers will find interesting and unique ways to use the dual screens on the S2. The company hopes by announcing the tablets now, software engineers will create applications that will help sell the S2 tablet to a consumer base that’s become used to the iPad form-factor.